WORK is progressing well on the new wave pool prototype construction located near Mt Jim Crow in Bondoola which is expected to be complete in the next few months. Surf Lakes CEO Aaron Trevis said excavation had been completed and elements of the construction were being built and assembled on site. "We had a bit of delay due to the rain but we are happy with the progress of the project and hope to be fully functional in the next couple of months," Mr Trevis said. "Right now we are focusing on delivering the prototype which will be a demonstrating model at this stage. "We have lease approvals to use the site for demonstration purposes for the next 12 months." Mr Trevis said to open the facility as a commercial venture would require a completely different business model and would require a whole different set of approvals. 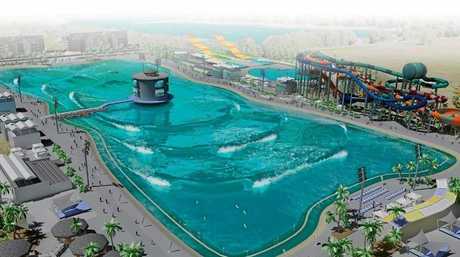 Artist's impression of a similar wave pool design. 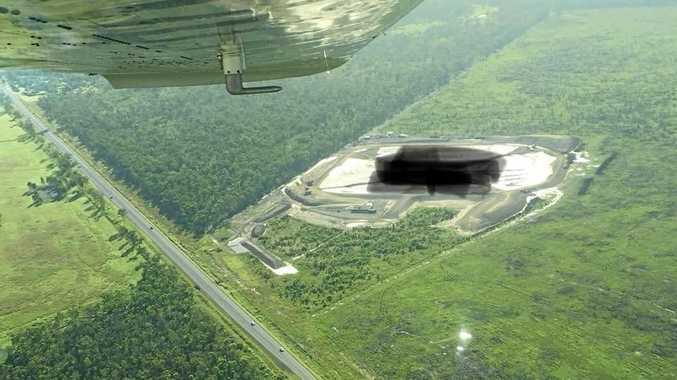 "While the site will not be open to the public at this point, we do hope that down the track we will be in the position to operate commercially and the fabulous weather all year at this location would provide the perfect conditions," he said. "We would need further investment, approvals and modifications before we can consider any commercial operations. 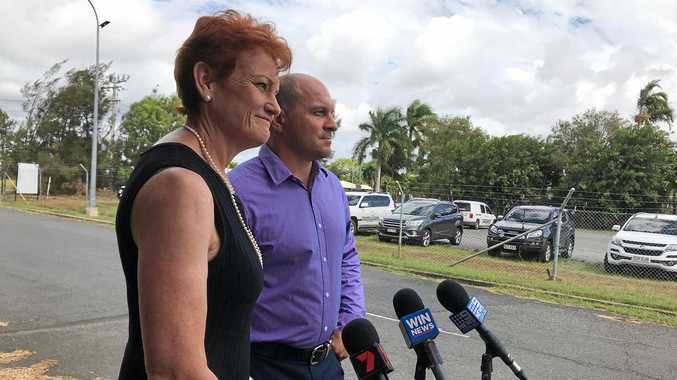 "We will be doing a series of information sessions about the project over the next couple of weeks, beginning with the Capricorn Enterprise members networking evening Wednesday night which will be followed with further information sessions in Brisbane and on the Gold Coast." 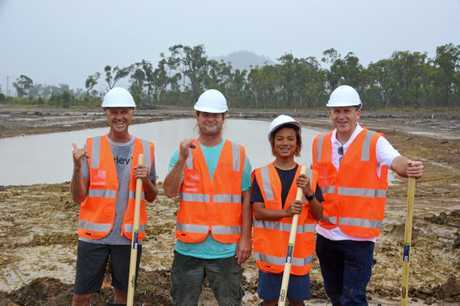 Barton Lynch, Mark Occhilupo and his son Jay join Surf Lakes CEO Aaron Trevis on a site inspection of works earlier this year. Mr Trevis said Surf Lakes hoped to be the first surf park in the world capable of producing eight separate waves simultaneously. "The waves will vary in size and length, allowing for beginners through to experts to surf at the same time," he said. "By using concentric waves and multiple breaks, Surf Lakes is capable of producing more waves per hour, while also offering a variety of waves from hollow barrels, to gentle beginner waves." Surf Lakes Surf Industry Advisor and champion surfer Occy (Mark Occhillupo) is providing valuable input into wave design for the project. Mr Trevis said he was also designing his own break, called "Occy's Peak", a barrelling left hander that would be 2.4 metres face height (eight feet) and run for about 60 metres. "Surf Lakes utilises a mechanism located in the centre of the pool," he said. "This fires off a wave in a ring shape toward multiple waves located all around the pools edge, leading to the much higher wave count." Capricorn Enterprise CEO Mary Carroll confirmed that Surf Lakes had been a member of Capricorn Enterprise for over a year and as such, were pleased to be invited to offer information at the organisations members networking night. "Our members will be offered first-hand information about this exciting project," Ms Carroll said. "We will also have the opportunity to discuss just how beneficial a project of this magnitude will be for the Capricorn Coast."